Welp, Sam Davies just wrote the thing that’s going to convince the Apple-thetic spouses that the pro-Apple spouses should, indeed, get an Apple Watch for a holiday gift. Sorry, the former. And you’re welcome, the latter! Regular readers of mine know that I struggle with how to be the most mindful with the time I spend with my kids. I’m an adult with ADHD who’s constantly trying to figure out better ways to trick my brain into spending more time doing my favorite thing, spending time with my family, and less time doing shiny things, like checking Twitter on my phone. A gift from my father arrived in early June that’s helped me a great deal, Apple Watch. I know what you’re thinking, isn’t an Apple Watch literally a shiny thing? It is. But, it’s also a simple shiny thing. Whereas an iPhone is a glass computer in my pocket, a portal to infinite Internet distraction with zero friction, an Apple watch is like having a new cluster of nerves on your wrist that relieves the burden of remembering stuff from your main brain. The first way Apple Watch helps with this is with seamless capture. Anything that pops into my brain goes into a trusted system. My brain is bad at remembering things, so if I have a thought about something that requires action I raise my wrist and say, “Hey Siri, remind me to buy toilet paper,” and because I trust my system, it leaves my brain, as I know toilet paper will eventually get bought. You wouldn’t think it, but having this easy capture always “on wrist” is a huge difference. There’s no phone to pull out of my pocket and forget what I was going to add. There’s no temptation once that phone is out of the pocket to then mindlessly open up an app and see if there’re any new posts on Metafilter. The second way Apple Watch becomes like a new sensory organ is by literally tapping you when something requires your attention. Did you just walk into a grocery store? Here’s a tap reminding you that you’re out of toilet paper. Has eight minutes passed? The pasta’s ready. Someone’s calling you? Here’s enough information to decide if you want to answer it right now. These micro-interruptions1 give you just enough information so as to be aware that something happened, what that thing was, and whether you want to stop what you’re doing and go deal with it, but not so much information as to take you out of the moment you are in. Let’s say my phone rings at the dinner table. In no scenario am I going to jump up and answer it. Without an Apple Watch–because that call could’ve been anything–at least a small portion of my brain will be imagining what that call might have been while I finish eating my dinner. But with Apple Watch, a two-second glance, and I know it’s just the library calling me to tell me that a book I reserved is ready. I enjoy the rest of my dinner with more of my mind present. So how has Apple Watch made me a more mindful parent? When I get home, I put my phone away. If I’m at home, it lives on the nightstand. If something needs my attention, my watch will tell me. If I need to remember something, I tell my watch. Those idle times where’d I’d pull out my phone to “check Twitter for a second” while I wait for my kid to wash her hands, gone. Do I feel a desire to look something up on Wikipedia during floor time? I just “Hey Siri” it and I’ll look it up later. 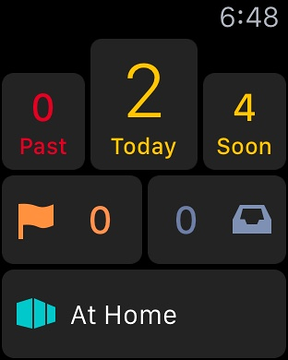 If I’m doing chores, OmniFocus for Apple Watch can show me just those things that can be done at home without cluttering my brain with workstuff. I recognize that other humans have brains that are different than mine. You may be able to do everything above without a shiny wrist computer. You may have a great memory, so you don’t need a computer to capture your thoughts. If you’re the type of person who can feel a buzz in your pocket at a restaurant and let it go, and not feel such niggling curiousity that you pretend that you need to go to the bathroom so you can check without being rude, then Apple Watch isn’t necessarily for you. For me, however, it’s become a valuable tool in my life. It’s helped make me more present during the precious few hours of my day I get to spend with my favorite people.